Debates in the field of manuscript studies often take the form of disputes over material details that are at least theoretically quantifiable: the curve of an ascender, the shape of a damaged leaf, the color of a paraph mark. Until recently, such debates were adjudicated entirely on the basis of comparison by human eyes. Paleographical and codicological research along these lines has been transformative: it remains the edifice on which rest all other forms of knowledge about medieval texts. Yet human eyes have scientifically well-understood limitations, especially as regards the perception of color. Recently, it has become possible to supplement the human eye with a digital one. Human eyes see in three colors, whose various proportions the brain interprets as the range of colors we perceive in the world. There are finer ways of slicing up the color spectrum, however. The eyes of some species have developed to see in more than three colors, enhancing discrimination between closely similar wavelengths of light. Computers, too, can ‘see’ in many more than three colors. 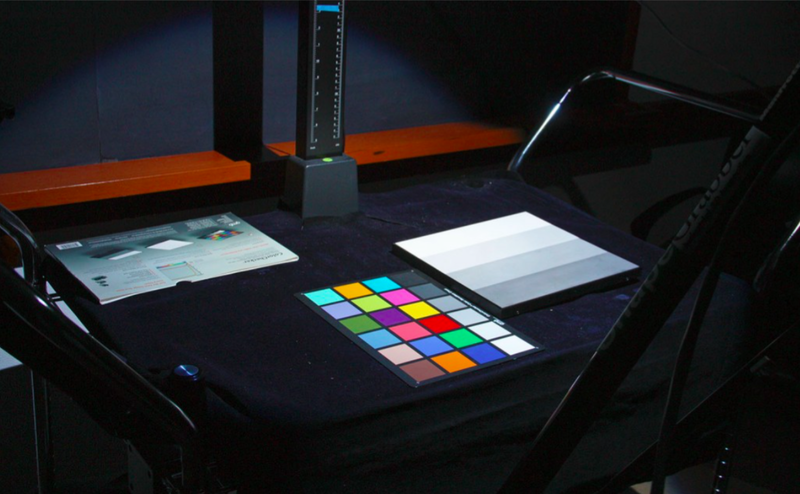 Digital capture of spectral information in more than three colors is known as multispectral imaging. (Hyperspectral imaging, marginally more accurate but substantially more costly and time-consuming, refers to digital capture of spectral information continuously across the color spectrum.) A non-invasive procedure involving a professional camera and a computer, multispectral imaging reveals differences in reflected light that remain invisible to human eyes. Multispectral imaging also captures data across the infrared and ultraviolet ranges, which lie, respectively, beneath and above our visible light spectrum. In other words, computers can be programmed to ‘see’ more and more finely than human eyes. Progress in computer science thus enables the creation of new kinds of data about medieval manuscripts (among other objects of interest). These new data promise to confirm, enrich, problematize, or even invalidate the conclusions of traditional manuscript study. This essay outlines the scope and goals of interdisciplinary research at the intersection of computer science, manuscript studies, and cultural heritage preservation. It does so through an overview of a case study: a research project in the digital humanities carried out by computer scientists, medievalists, and digital preservation experts at Yale University from 2012-2015 under the auspices of an Andrew W. Mellon Foundation Scholarly Communications and Information Technology grant. Entitled Digitally Enabled Scholarship with Medieval Manuscripts, this project had three arms, of which I will discuss one, “Creating English Literature, c. 1385-1425: Inks, Pigments, and the Textual Canon.” While at Yale I served as graduate assistant for “Creating English Literature” to Principal Investigators (PIs) Alastair Minnis and Barbara A. Shailor, who were later joined by PI Ardis Butterfield. The other two arms of Digitally Enabled Scholarship with Medieval Manuscripts are “Editions of the First and Second Recensions of Gratian’s Decretum” (PI: Anders Winroth) and “A Literary History of the English Book of Hours” (PI: Jessica Brantley).